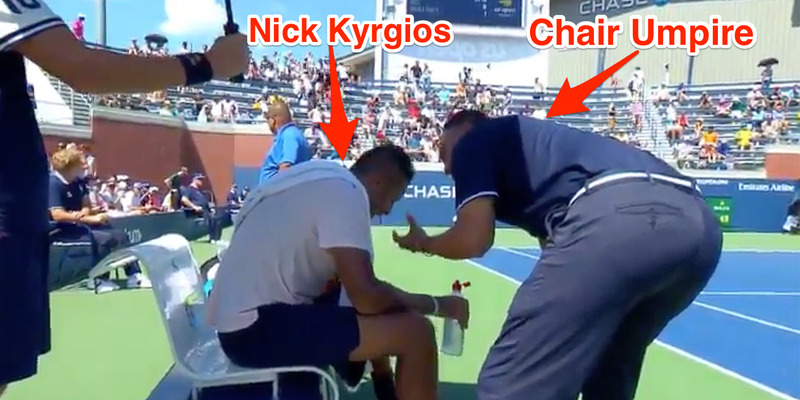 A chair umpire at the U.S. Open appeared to give Nick Kyrgios words of encouragement after he stopped trying on his way to losing the first set of a match. After what some have called a “pep talk,” Kyrgios went on to win the second and third sets. Many in the tennis world raised their eyebrows at the exchange and criticised the umpire for speaking to a player directly. A bizarre scene unfolded at the U.S. Open on Thursday during a second-round match between 30th-ranked Nick Kyrgios and Pierre-Hugues Herbert. The occasionally temperamental Kyrgios appeared to stop trying during the first set, failing to even move while Herbert served. Herbert won the set, 6-4. After the set was over, the umpire, Mo Lahyani, got off the chair and went over to Kyrgios, appearing to offer him words of encouragement. Singles tennis is just that – players don’t receive outside help. It’s unusual to see an umpire address a player without doing so through the microphone. Kyrgios went on to win the second, third, and fourth sets to win the match. Plenty of others in the tennis world raised their eyebrows or flatly criticised Lahyani for his actions, including Rothenberg, who called it “insane” and called for Lahyani to be pulled from the match. Lahyani for coach of the year! Later on Thursday, the U.S. Open put out a statement, explaining the interaction between Lahyani and Kyrgios.